Laguna agate displays some of the finest fortification patterns of any agate in the world. Fortification refers to the banding which is reminiscent of the outline of old forts in feudal Europe, according to Gibbs (below). In addition to beautiful agate photographs and photomicrographs, Gibbs offers an overview of theories of agate formation. He shows the process with clear graphics then with actual images of similar structures so his logic is easy to follow. He explains that "crazy" lace patterns occur when the agate bands are distorted, twisted and curved. This huge gorgeous stone displays both lace patterns (e.g., along left edge), and very fine fortification banding in the lower portion surrounding the crystals. Zenz shows some amazing Laguna in Agates, Agates II and Agates III, and be sure to check out the profile of Philip Stephenson who cut this stone in Agates III! 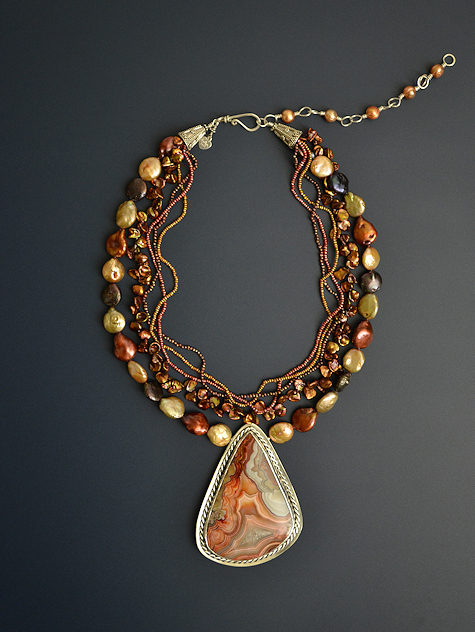 Do you also get lost wandering around in beautiful agates like this, marveling at their exquisite colors and patterns? There wasn't much I could add to Philip's amazing stone except a way to hold it. A heavy twisted wire decoration echoes the twisted patterns in the stone. The back is open to let light through the stone. Lots of yummy pearls complete the composition. So what's with the name? For some reason the stone reminded me of the Great Rift, Dark River or Dark Road, the dark region that divides the bright band of the Milky Way. It consists of a series of overlapping non-luminous molecular dust clouds which obscure the galactic center. The ancient Maya correctly deduced that this feature marked the center of our galaxy, and they seem to have known there was a "dark sun" (black hole) there. This is the cosmic womb from which everything in our Galaxy came and from which new stars are born. The Mayans saw a cosmic cross ("sacred tree" or "crossroads") in the path of the ecliptic across the Milky Way. Their calendar system recognized that the ecliptic comes into alignment with the Great Rift every 6,450 years on either a solstice or an equinox. The winter solstice alignment occurs every 25,800 years, as it will in 2012, the "end" of the Mayan calendar. Let's try to wrap our minds around the idea that the ancient Mayans correctly identified the center of our galaxy long before Copernicus published his first drawing of the heliocentric solar system. So while Europeans were still grappling with the horror that the sun and everything else might not rotate around the earth, the Mayans had already built monumental pyramids to measure precession so precisely that their calendar system could predict 25,800 year astronomical cycles. I mentioned more about this in relation to the Sunface Turtle Necklace if you have an interest, or better see John Major Jenkins' most interesting book below. 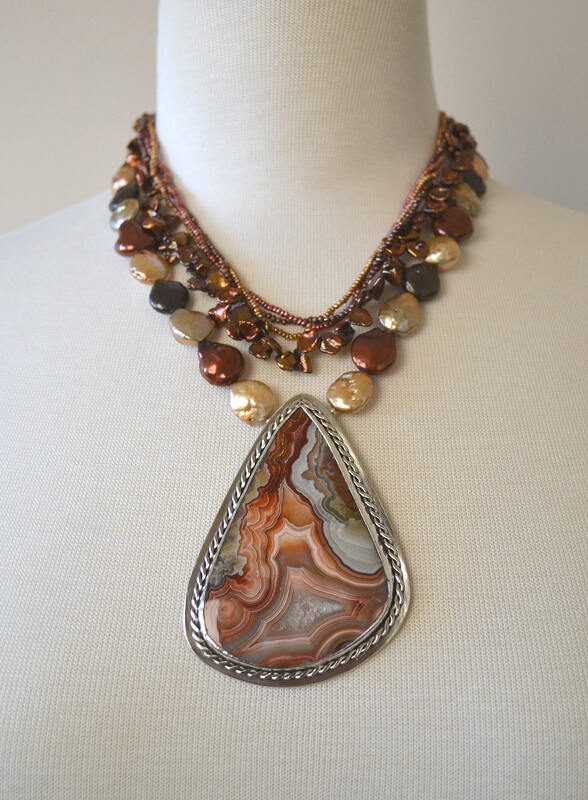 At any rate, I hope you will purchase this necklace today and enjoy this fabulous stone.